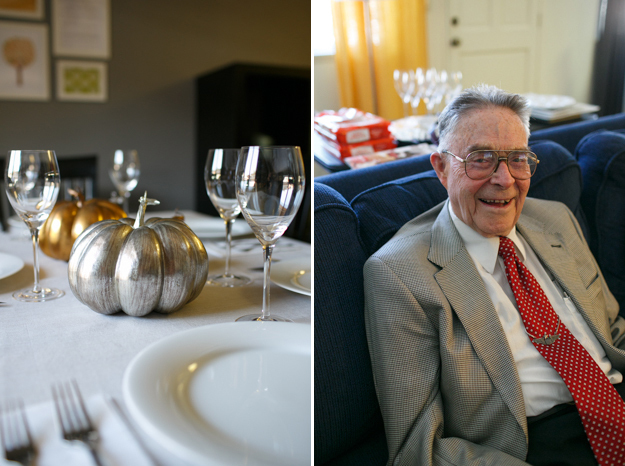 Last week, we hosted Thanksgiving dinner at our place for the first time. We've hosted holiday dinners in years past, but never Thanksgiving. It was Jeff's first time cooking a turkey and his first time baking an apple pie. I was pretty confident about the turkey, but skeptical about the apple pie. I'm happy to report that the dinner as a whole was successful, we had plenty of food to go around and no one got food poisoning. We called just to make sure a few hours after my family drove home (: As promised, here's a quick review of what worked and what we'll do differently next time. Because my mom is pretty sold on us doing all the cooking from now on! WHAT WORKED: We basically rocked out all the side dishes. And I say we because contrary to popular opinion, I actually know how to cook. I just don't like cooking as much as Jeff does. I made mashed potatoes, something we've actually struggled to make delicious in the past, and they were really good. Following a recipe and improvising slightly with what to mix in worked in my favor this time. Jeff made his mom's recipe for broccoli cheese casserole and everyone loved it. Even me and my dad and we don't even like broccoli! I made my great grandma's recipe for cranberry sauce and Jeff made my grandpa's recipe for stuffing under my dad's direction. We also had a light salad and store bought rolls. We tried to keep the oven as clear as possible so we didn't disturb the turkey. 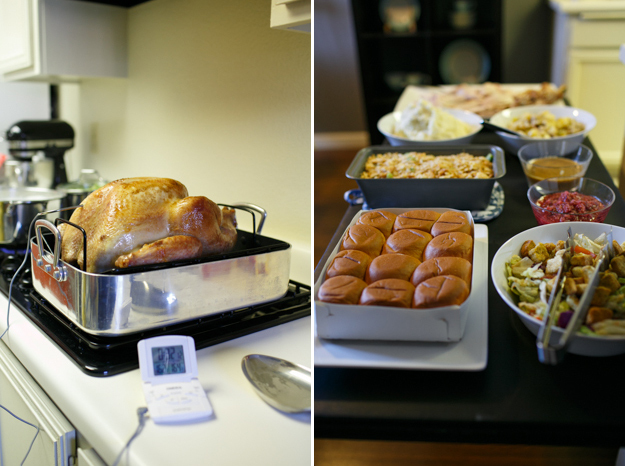 WHAT WE'LL DO DIFFERENTLY NEXT TIME: I don't want to say the turkey didn't work, because that's not entirely true. We all ate turkey and we all agreed it was the most moist turkey we'd ever had. Even my 89 year old grandpa and he's tasted quite a few turkeys over the years. 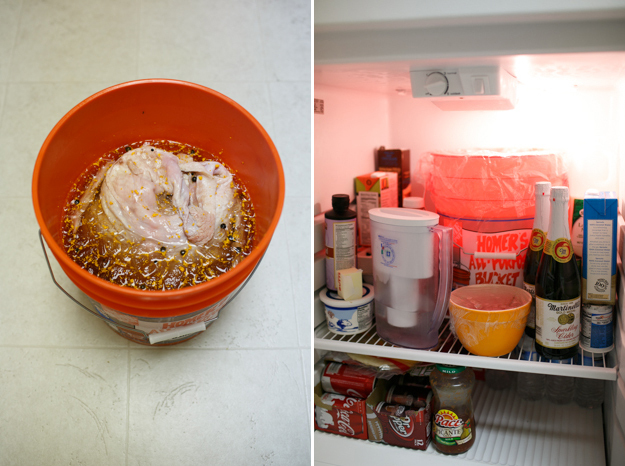 Jeff followed this amazing recipe which included a special homemade brine, a giant bucket in our fridge and a special thermometer attached to the turkey while it baked in the oven. Here's where things went slightly astray. 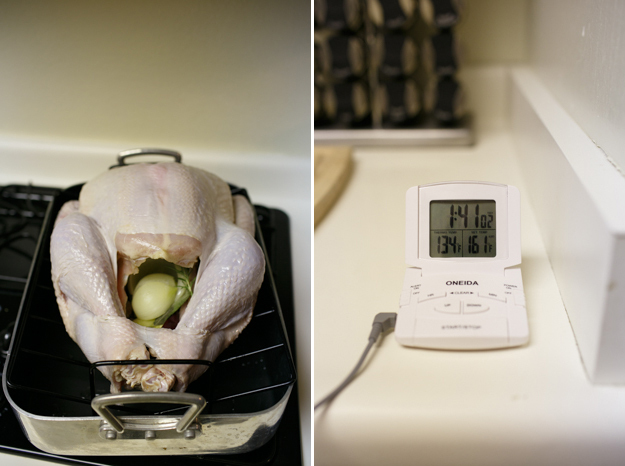 The placement of the thermometer in the turkey is critical and complicated. If you place it in the wrong spot you get an inaccurate reading for the turkey as whole and either over or undercook the bird. In our case it was slightly undercooked in one spot which was the part we didn't eat. The parts we did eat were definitely cooked, but Jeff and I were slightly spooked. Hence calling to make sure no one got food poisoning! Next time, we'll be more careful with the thermometer placement and once the turkey comes out of the oven (you're not supposed to open the oven at all while it's cooking) we'll do a few tests in different spots just to make sure. Now let's get to the pie. Overall, it was a success and everyone had a slice. Some even had seconds. But there's one thing the recipe and the overly confident lady at the store forgot to mention: covering the crust on the outer rim of the pie with foil. It looked amazing when Jeff put it in the oven, but shortly after we saw it browning and browning fast. There wasn't much we could do because we knew it had to bake for a certain amount of time, so we waited and held our breath. The edges were slightly burnt, but the rest of the pie was fine. So it wasn't a total disaster. It wasn't even a disaster, but when I smelled it burning in the oven I thought we were going to have to use my peppermint ice cream for dessert. Thankfully everyone liked the pie and my gallon of pepperminty goodness was spared. Aside from the meal and burning off all the calories I consumed cooking parts of it and cleaning up, my absolute favorite part of the day was taking some family portraits, which is something we rarely do with my side of the family. As a photographer, I'm usually the one taking the photos and I'm rarely in them. 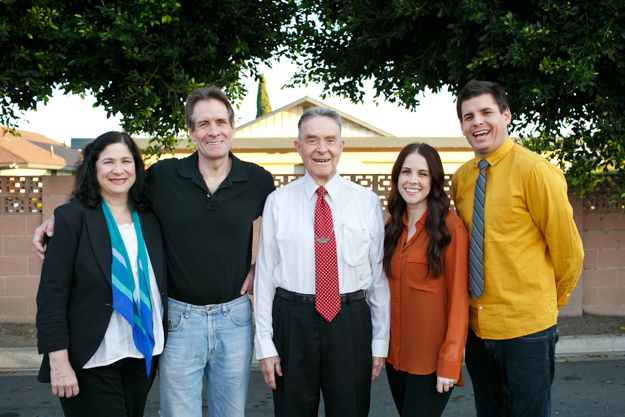 This is always a problem when we want to take a family photo and usually Jeff is the one taking it if I want to be in it. This time we got smart and used a makeshift remote and a tripod so we were able to take multiple photos with everyone in them. 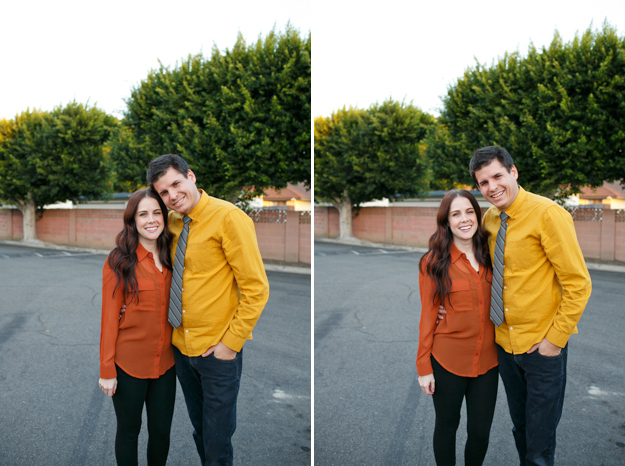 We also gave my mom a quick tutorial so we could have a few photos with just me and Jeff together. And momma rocked it out. But ya, you definitely need to stick the thermometer in the meatiest part of the wing. Now that you've mastered an "A" Thanksgiving, you'll be ready for the "A+" next year!!! Call me when you have a moment, I want to share something with ya!